I don’t follow the zodiac much but from what I’ve read I am a Libra to my core. I’m crafty, creative, like things balanced all of that. My favorite part of Mi is that I’m such a dreamer. I dream in color honey, and in big graphic images with glitter and everything. My dreams are detailed and crazy all at the same time. 4 years ago I was in such a different place. I only had one kid calling me Mommy, and now I have two. I was a contractor looking for a good federal dream and I found it. I had a cute little Mazda Protege that I loved and now I have an SUV full or kid movies and old french fries and crumbs. O_o Fly, not so fly. The biggest change is that I’m a business owner. WHAT WHAT! One of those dreams you could say. I didn’t see it coming but I certainly welcomed it with open arms. I am a serial crafter, I get hooked on one thing and then I go balls to the wall with it. Then I’m over it and move on to the next craft and rinse and repeat again. August 2013 I opened From Mi To You and we custom design canvas shoes with all kinds of funky things like rhinestones (bling), Lego’s, buttons and any other creative things that come to this mind. Remember I said I was a dreamer. When I started the business again I had no expectations and I’m still in awe of how well it has done. I decided I was going to just see where it takes me and enjoy the ride. Well I’ve been doing just that. 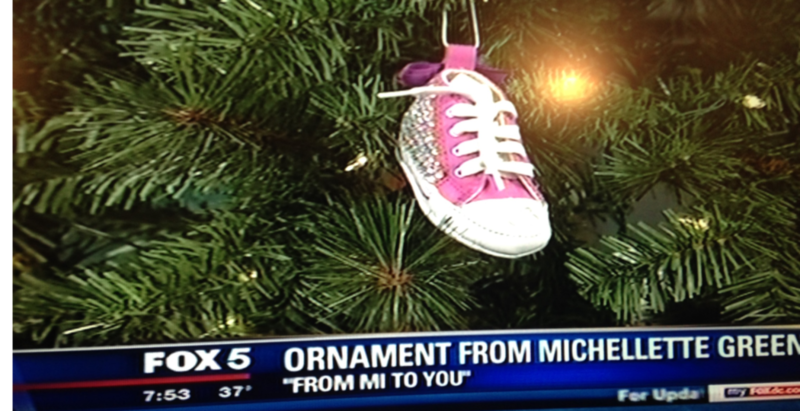 I had a small product feature on Fox 5 in December, I was like a school girl with excitement. Now From Mi To You is being featured on Fox 5, February 25th @5:45pm during the Laura’s Likes segment. Feb. 25th is becoming an important day for me in blogging and business. If you are in the DC viewing area TUNE IN! In these four years I’ve learned that when things are meant for YOU, they will fall into place without force. TWEET THAT! #mimicutelips I will simply continue to dream. Amazing! Congratulations. Nothing like having a passion and having it supported. I’ll be ordering my daughter some very soon for the summer! Thanks, Mimi! I actually thought of you this weekend. I was working on a pair of pink and green Chuck’s. lol I look forward to your order. Thanks Heather for all of your support! Its so appreciated. This is awesome! SO happy for you! Keep it up…finding your passion and following through with it is everything. XO! Thanks so much Whitney, this process has taught me to just DO IT! Congrats on your blog and your adorable business!! !